The moment I first came across MakerBeam at Kickstarter.com I liked it and backed the project. That was in 2009. I am an electronics engineer and I love to make things. I could envision MakerBeam to come in quite handy when building stuff. Since there is no welding or drilling needed I saw myself using MakerBeam on my desk or dinner table. Living in a city and not having access to a workshop or garage this is a big advantage. Time, or the lack of time, also always is an obstacle. MakerBeam offered me a fast method of assembly for a project of my choice. The cross section of 10x10mm struck me as perfect.The opportunities MakerBeam offered were endless. I was hooked. 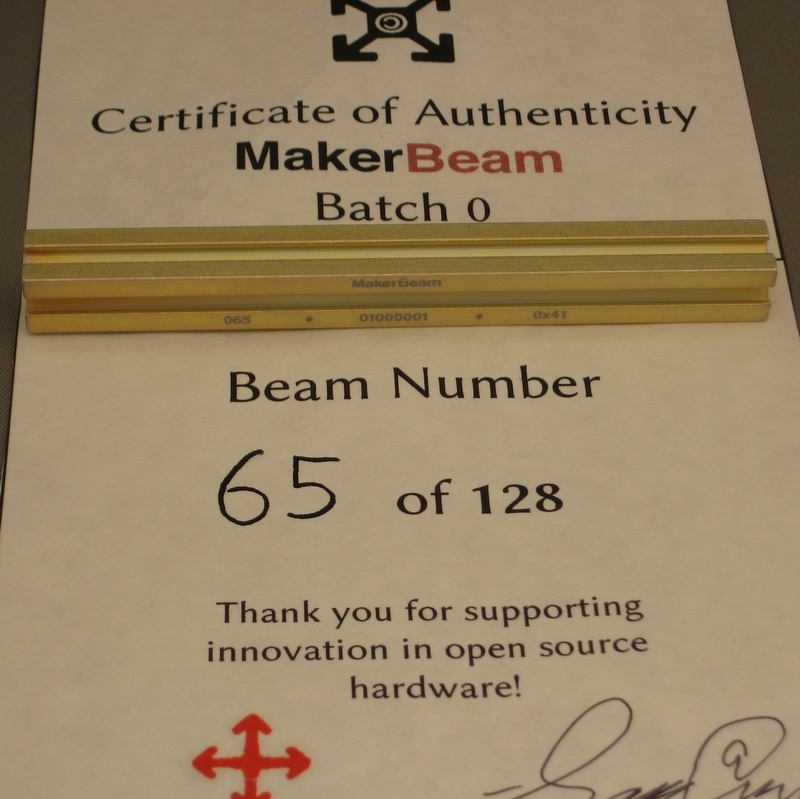 It was great to receive the first MakerBeam. Then the website of MakerBeam remained 'under construction' and I was disappointed like so many. It took a while but slowly I started to think about it differently. What if I could sell it myself? As an entrepeneur I like the fact that MakerBeam offers professional quality. A prototype can actually be put to work. Or the material can be reused at low cost. To be able to build something on a desk, rather than in a workshop, should also be an advantage in schools and laboratories. MakerBeam is great prototyping material: fast, easy and infinitely adjustable. From both standpoints, engineer and entrepeneur, I love the appearance of MakerBeam: smooth, strong, small and beautiful. So why not just do it?! In 2011 our webshop went live. The classic MakerBeam we sold then is very different from our current design. What remained is the size: 10x10mm. From there we went on to introduce a whole range of products and aluminum profiles to our product range. If you want to know more about the differences between our beams please visit the blog on our webshop (tag: technical details). Here is a link. One challenge I would like to mention is our hunt for the best screw for our beam in 2012. We finally found it with our square headed bolt with hex hole. You can read more in our blog post: New bolts. And the final choice for the square headed bolt is documented here. Version 2.0 anodised in black and clear was introduced in June 2012. Here is a blog post. It was time to expand and start looking for more resellers. In 2014 we introduced MakerBeam with threaded ends and got a positive review by Evil Mad Scientist who supported the launch of the Kickstarter project for the classic MakerBeam. In October 2013 we introduced MakerBeam on Amazon.com to accommodate US customers. The initial enthusiasm for MakerBeam had faded away there. We aimed to reignite this fire and succeeded. We are now working on the availability of MakerBeam clear anodised on Amazon. MakerBeam with a hollow core and threaded ends all lengths in black and clear anodised is now being sold in shops all over Europe. You can click here if you want to see a list of where you can buy MakerBeam. Meanwhile we also added OpenBeam to our product range. More robust (15x15mm), but still small. Less smooth but with more strength and we do not need to go on another quest for the right bolt. Now OpenBeam black anodised is available accross Europe. You can click here if you want to see a list of where you can buy OpenBeam. With PCBGrip we made our product range more divers. Late 2016 we introduced MakerBeamXL black anodised. 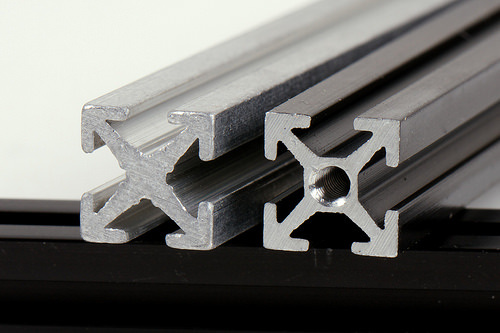 MakerBeamXL is essentially a MakerBeam profile but with a cross section of 15x15mm. Same strength as OpenBeam and hollow core, but smooth like MakerBeam and threaded holes each end all lengths. In 2017 MakerBeamXL clear anodised followed. MakerBeam is still growing. We have grown into a company that specialises in the sales and production of small aluminum T-slot extrusions for professional prototyping. Not sure what that means for the future. Enjoying the ride so far. I hope you will stay tuned to see where we are going.